Hungry for an exciting new treat? 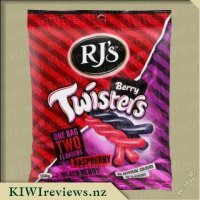 Try RJs Twisters. They come in a range of delicious flavours to tantalise your taste buds, but here&apos;s the real twist... they don&apos;t contain licorice. A delicious Grape gummy, filled with a sour Lime sherbert filling. I love RJs and love their sweets. I love grape and lime, and I really really love sherbert filing cause it gives me a yummy taste and a great feeling. How the packaging is great it always is, it tells you what you have and what you will have, grape and sour lime OMG so good as you look at the package, when opened it is this lovely purple and you can see the green inside its the sour part or so the package says. So I thought I would have a taste, now I was getting excited cause I love these flavours so much and I love a good sour burst. But sadly I was disappointed the grape had not grape taste it was very faint but not really nice, and the lime wasnt sour but I also couldn&apos;t taste the lime. I didn&apos;t find the sweet nice, I actually felt I was eating wax with no flavour. I thought maybe I had ad tastebubs at the time so I got my partner to try it out aswell. He tried a bit and spat it out he said it had no flavour and a weird break away taste in his mouth, he said it left his mouth confused on what had been eaten. I really wanted to try and review one of these because the description of a Sour Licorice Log reminded me of a product I used to eat in my childhood and loved. I wanted to be able to share with my children a memory that was obviously important enough to me to remember (I have a shocking memory so this is pretty big for me). I was really lucky and managed to get not one but three logs in my review parcel which was ample to share with my kids and husband. I love the bright colours that on on this wrapper, I found it to be very colourful and fun and a little more inviting to me than the Cola and Raspberry packet. My daughter, whose favourite colour is purple also really loved the packet but more than that she loved the taste of the Twister Logs. She thought the sherbet inside was one of the best flavours she&apos;s actually ever tried and she didn&apos;t want to share any with her brother. 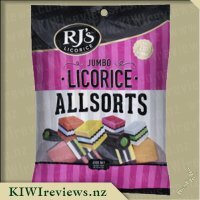 My son thought the licorice was just the right amount of chewy and the sherbet was nice a fizzy on his tongue. My husband quite liked the idea of the sherbet with the licorice and said he also remembered a similar product from when I was younger but this one didn&apos;t quite taste the same as the sourness wasn&apos;t there. He still liked it but said he wouldn&apos;t "go out of his way" to get more. I thought the Grape licorice flavour around the outside was "on point", not overpowering and not sickeningly sweet. The Inner lime sherbet flavour was good but it lacked the sourness I was expecting and hoping for. 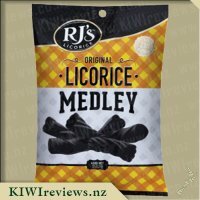 As with all of RJ&apos;s licorice, the quality of the licorice was great. It was soft and easy to chew but didn&apos;t remain stuck in your teeth too much (although being licorice there is always going to be a bit stuck in your teeth). 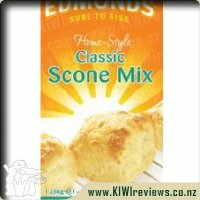 Overall, with the great price of $1.29 each I think these will be a great seller and perfect for a quick and easy sugar hit with plenty in each log to share. As soon as this hit the shelves in the shops both of my girls have been begging me to get it. I am not a huge fan of the flavours lime or grape and I really do not like sherbert so it was a definite no from me. But as this has come up for review somehow I managed to receive some. As soon as the girls saw it in the box they both starting squealing and begging to try but as we were on our way out I said no and put in the fridge and promptly forgot about it. However, as both of my girls have memories like an elephant it was not long before they remembered and basically every day they have begged to try one. The wrapper is very inviting and shows the vivid colours of purple and green and has an example of what the Log looks like. Opening up the wrapper you are met with exactly the same image and the colours are basically the same. The green is very vivid and lush and the purple is rather dark so very fitting for the flavours. Taking a bite you are met with the grape which is nice and then hit straight afterwards with the lime and then the sherbert takes over so it definitely delivers on what it promised. 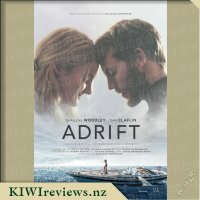 As I expected I am not a fan but as for the rest of the family my husband said he enjoyed the outter part of it but the center was a little full on. The girls got to share one and true to form they claim to love it and are begging me to buy some more. 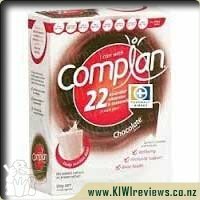 I think the price is spot on and since its xmas you never know what might show up in there advent callenders. RJ&apos;s definitely make some amazing products - I think many of their products make it into my top list of treat foods. 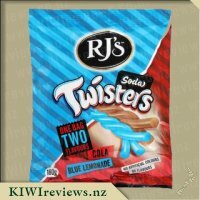 I always request RJ&apos;s products when they come up for review, and was lucky enough to be chosen to try these Twisters along with another flavour. Grape is usually one of my favourite flavours, closely followed by lime so I thought these would be amazing - two favourite flavours in one. I am however very torn about this product! Upon taking my first bite I wasn&apos;t overly impressed. The grape was there, and so was the lime but I&apos;m not sure I would call it sour. I do wonder whether it is because they are two flavours I enjoy separately but not together. Neither of the flavours appeared to stand out over the other and I think my taste buds got confused! My partner tried some too. He also wasn&apos;t sure whether he overly liked it or not. He did mention that it isn&apos;t one he would go and buy as there are other things he enjoys more. I do have to say though that I really did enjoy the texture of this product. It was nice and soft, but it wasn&apos;t sticky in your teeth. There is nothing worse than having a nice treat and spending half an hour trying to get it out of your teeth! I peeled some of the outer candy layer off to try it by itself. This layer when eaten by itself had a very odd aftertaste, and I&apos;m not quite sure what it was. There was a very faint flavour of grape, but it wasn&apos;t very strong. The candy was definitely nice and soft and easy to peel away from the centre. The centre seemed very much like a compacted sherbet. The flavour of this was yum - a nice, almost fizzy type lime flavour. Not sour, but it seemed fizzy. I do think if the whole product tasted like this I would like it even more. Thank you for the chance to try another RJ&apos;s product. I don&apos;t think this is one I will purchase again as there are other RJ&apos;s products I prefer a lot more than this one. 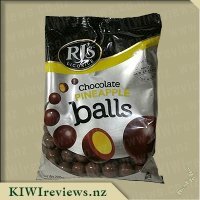 Rj&apos;s is a staple brand name in the candy industry and have well and truly set the bar high for their competing brands. 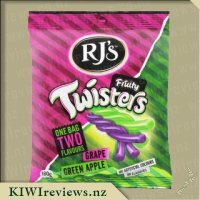 The Rj&apos;s sour grape and lime twisters are wrapped in a packet that bursts of vibrant green and purple colours that suit the flavoured candy inside. It also has an illustration on the packet which shows what the twister log looks like which is a plus if you haven&apos;t had them before so you know what the product actually is. I opened up the packet with its easy tear strips and it peeled open to a prominent smell of sweet grape. I took a bite of the candy log and it is so soft and chewy with a slightly gritty centre. The flavours of grape and lime paired so well and the sherbet lime centre had a sweet and sour taste to it that leaves a nice fizz sensation. The only flaw I have with this is it is too sweet for me and I&apos;m used to sweet products. Looking at the nutritional information I see it is stated that it has 19.9g of sugars per serving of one log so I can see why it is so sweet. I cut four small pieces up for my children and they loved them which wasn&apos;t a surprise at all as they love sour lollies. The sour range has become my go-to candy at the time and I would purchase this product again because I am a fan of Rj&apos;s and support local brands where best I can. They are a great tasting candy and my children and I enjoy them thoroughly. It won&apos;t be long until I have tried the full Rj&apos;s product line. My family loves RJ&apos;s products so we were excited to try this after previously trying other Twisters products. It&apos;s a great size for a single snack, and the bright green and purple stands out making it easy to find on the shelf, which my kids spotted when we purchased more. The picture on the packet though was brighter than the actual product but this doesn&apos;t matter too much. These are also well priced being around a dollar. The first bite was amazing the two flavours, grape and lime going well together. The sherbet on its own was nice and sour enough for me, although I don&apos;t like things to be too sour. The grape outer on its own was a little flavourless so I recommend just biting it and chewing all together like the kids did! 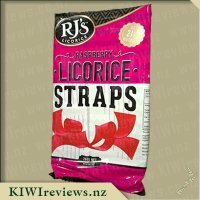 My partner said it was delicious and he likes the nice soft licorice and that it was nice and chewy. He&apos;s on the road all day for his job and thought these would make some great snacks for in his glove box. The kids had no complaints and shared a bar between them, which I don&apos;t think was too much sugar for them. RJ&apos;s is a NZ company so it&apos;s good to know when you are purchasing this brand it&apos;s helping out the economy, not only that their products are delicious! Mr 15, Miss 17 and I shared this product. That was easy as we had three small rolls so took one apiece. As usual, I took my time over my share. Miss 17 ate hers over the course of a day. And Mr 15&apos;s was gone in a couple of minutes! Grape is a flavour that none of us would normally buy so it was interesting to share our impressions and to discover that we all had a different reaction. Miss 17 was surprised to find that she really liked it, and the cost is reasonable enough for her to want to buy it again. She especially liked the texture as she thought it had just the right balance between firm and soft - her description was "just the right amount of chewy". She also liked the flavour because it was neither too strong nor too sweet, although she did say the sour aftertaste she had expected did not seem to be noticeable. But on balance she enjoyed it and asked if there was any more! Mr 15 had already tried another product in this range so was keen to try this one. Before eating it, he unwrapped it and made a "rescue flare" with honey roast peanuts and a banana because he thought it would make a fun centrepiece for a plate of nibbles to go with his aloe vera drink. At his request I photographed his artwork and then he proceeded to eat everything except the actual banana skin. He did not think the log was as tasty as the one he had tried previously, but thought it was pleasant enough. He liked the grape outer but was not sold on the lime centre; he would have liked it stronger. It just was not sour enough for him. I took my time over my own log. First I tried it on its own. The flavour was pleasant although not as special as others I have tried - but maybe I have been spoiled for variety! There was a slightly artificial smell to the sweet when I first opened it; it reminded me of the odour you get from fresh lacquer when it is still drying. 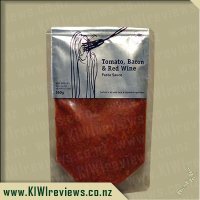 However, it tasted fine and the label assured me that the ingredients are 100% natural, so it might have just been that release of air you get when you first break the seal on a packet. Unlike Mr 15, I preferred the lime inner to the grape outer. Which all goes to show that everyone reacts differently to a new product. Incidentally, I tried a little of my log with a piece of banana, and another with some honey roast peanuts. He was spot on with his choices; both of these went well with the grape and lime flavours. 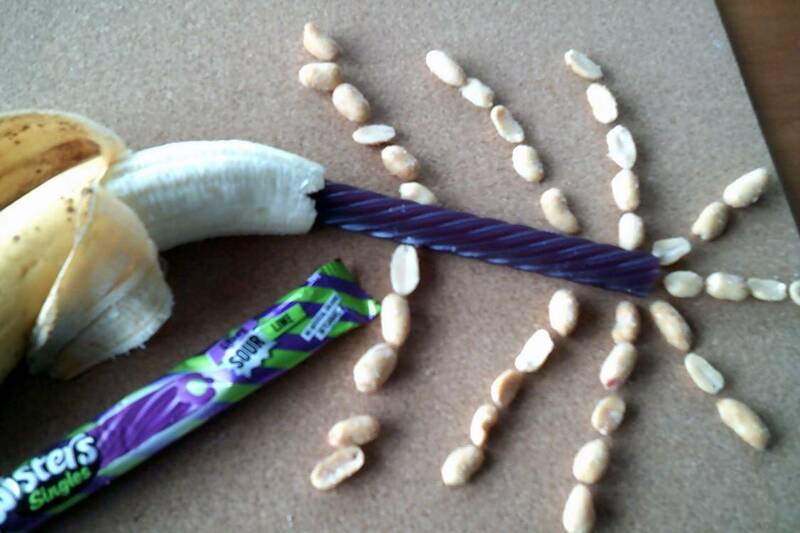 The banana toned down the grape slightly, while the peanuts enhanced the lime. I think I will use this combination for a nibbles platter myself some time, although I might not copy his artwork. Just the ingredients! I have a very sweet tooth so love most licorice. 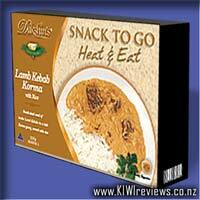 RJs is a brand I buy before anything else, they have never let me down with flavour and quality. These Grape & Lime Sour Twister Logs caught my eye with their pretty purple and green wrapping. It was clear to tell what I was about to open and try. So will be easy to spot next time I run into supermarket and at $1.29 each it will be a nice wee extra to clear up any change I have. After fighting off 4 children, I had to hide in the bedroom to sample, because I swear they heard me rip open packet. Upon opening packet you could smell the grape flavour, it was such a nice hit. Biting into this log you are hit with the lime taste, which to be honest I am not a fan of anything lime, this is why I was wanting to sample this. I found it wasn&apos;t too overpowering of a flavour to feel like finishing this log. The sherbert took a few seconds to hit and it was very sour. I did, in the end, split one log into 4 pieces so that the children could try and they all loved it with their funny faces as the sherbet kicked in. These are a perfect size to have in car, handbag, nappy bag etc for a wee sweet treat on the go. I will be buying more of these and the other flavours, to add to our sweet treat box for future car trips. With them being in single packets will be easy to hand out in the car. 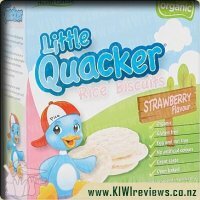 I really enjoy RJ&apos;s products and that they are a New Zealand company - so am supporting local too! They are consistent with their quality and taste - meaning you have a good idea of what their product might be before you taste it. 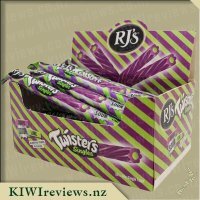 New flavours and ones I have not yet become aware of (as I try to limit my consumption of sweets and treats) is always great - so seeing these Grape and Lime Twisters come up as review products I requested them and hoped I may get to try them. I was lucky enough to receive more than one log in my review box - meaning I did not have to share with the three kids or hubby to try them! The Twisters Singles Log is a great size to pop into your bag or to have as a treat - but in all honesty - half is great as well - making them very cost effective when you have three kids! I love that there is no chance of melting that you get from chocolate treats - a big plus for this Mum that hates mess in her car!! The packet is easy to tear open but I prefer to cut it, so I do not end up squashing the treat as it comes out. Cutting it open you could smell the grape - and it reminded me of hubba bubba and grape cola - so I was eager to try it and the lime sour sherbet in the middle. I cut some up for the children to try too - being that they have sampled a few of the sour offerings from RJ&apos;s I knew that they would give honest feedback, which they did. Like me they really enjoyed the grape gummy outer and said it smelled like fruit - biting into the lime centre was met with a few grimaces, but in a good way. I found the lime to be a really nice sour - a bit of a kick to it that not all the other flavours have - maybe as the grape is a more natural flavour that helped, I am not sure - either way the grape and tarty lime worked perfectly together, and I ended up eating the bits my children offered, as they found it a little too sour. 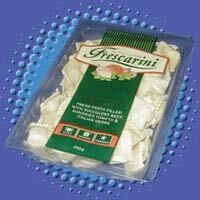 I will definitely buy these again - but think I will cut them into smaller bits and ration them out a little. 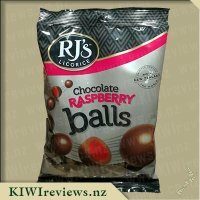 Well done RJ&apos;s - these are a great tasting treat!! Grape is a flavour I utterly love so I was keen to see how this matched with Lime as it&apos;s normally a flavour I don&apos;t like... somehow though this flavour combination worked just magically. The grape is sweet and the lime is sour (but not to sour) meaning it balanced this treat perfectly so each mouthful was just right. Being not like licorice (according to the packet) but still like licorice (because that&apos;s what my mind tells me) meant that I instantly compared the two; this lolly version obviously requires more chew but it still packs a great flavour punch and isn&apos;t so chewy your teeth would fall out if lolly&apos;s of that varitey are of concern to you. 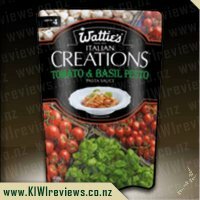 The eye catching, easy to open (tear) packaging stands out in a crowd (let&apos;s face it - the checkout counters, lolly isles and everywhere you would find these morsels are croweded these days) so I feel like this is a real advantage. I also really like the package sizing - I don&apos;t really need a massive bag full (need vs want of course haha) and any more than one has me either over eating or akwardly trying to share (or save for later) so this was just perfect! One of the rolls I had for review I also shared with my children and found breaking pieces off mangable so this is another great option. Both children (aged nearly 3 and 5) demolished their piece in seconds and their little hands were pleading me for more so that&apos;s another vote in the right corner from our household I dare you to indulge your tastebuds and try one today! When running from appointment to appointment to activity and home again, it&apos;s always handy to have something that you can throw in your bag, gives a bit of a sugar boot for the flagging energy and can be easily split up into three or four portions. These RJ&apos;s Twisters Singles fit that bill well and so found their way into my bag waiting for the right opportunity to give this a go. I pulled this out of my bag after the kids had a big workout in gymnastics and were complaining of starvation. The first thing they all commented on was the colours on the packet and tried to guess what the flavours might be. This feels nice and gummy but it also easily twists in order to break it into a few pieces. All three of my kids gave this a thumbs up and quickly requested more, which was easy as to do and it quickly vanished into their stomachs. Now, if you&apos;re like me, you can actually nibble off the outside grape gummy and then savour the lime sherbet. I didn&apos;t find the lime to be sour at all, there was a slight tang to the flavour but I wouldn&apos;t class this as a sour lolly. My kids all stated that I should definitely buy this again for them and at $1.29 each, that&apos;s a pretty fair price. Some friends and I got together being lucky enough to try a few of the RJ&apos;s products and all of us having rather sweet tooths! The single wrap log is a nice size for one person and would be easy to stash away for a quick snack and a reasonable size for kids as well. We cut our review ones up so that we could all try it. This flavour was definitely a popular one, there was pretty much a simultaneous gasp of "OMG!!!" and then one lady stealthily snaffled as much of the grape/lime as possible. We all agreed that it tasted like grape hubba bubble gum. It had a slightly tangy taste but none of the four of us would say that it was really sour. This was a little disappointing as we did hope for a really decent sour hit but all the same, the grape flavour with the subtle lime still had us really enjoying it. 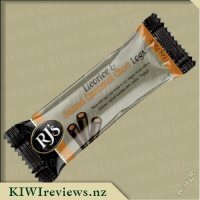 Overall, this one was a big hit with us and we would all buy it again, either as an individually wrapped log or in a pack like some of the other flavours. 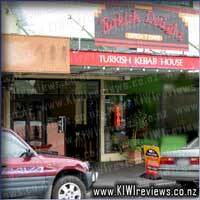 Reasonably priced and we felt it was good value for money. 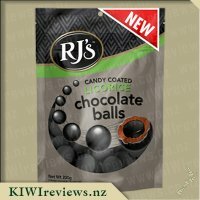 I love supporting NZ made products and brands, and have come to love RJ&apos;s products. 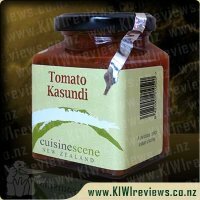 I am constantly checking to see if they have released any new creations to their range. 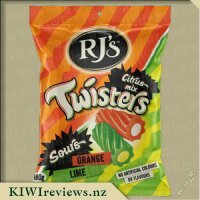 When I saw that KIWIreviews had some of the new range of Twisters available to review, I knew I needed to try these RJs Sour Twisters Logs - Grape & Lime. I sent my request in and crossed my fingers to be chosen. Upon opening my box I saw three of these and decided I would have one, my partner would have one, and our children could share the other one. The Twisters Single Sour Log is a perfect size for popping into a handbag or leaving in the car for a quick snack on the go. The contrasting colours between the purple and the green, accompanied by the black from the RJ&apos;s logo is striking. 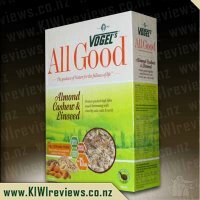 A major positive point for this product is that it contains no artificial colours or flavours. Once I had peeled the wrapper open I was instantly met by the delicious, unmistakable smell of grape which got my mouth watering. The purple gummy outer layer was a nice shade and worked well with the vibrant lime green inner. I decided to pull a piece off and taste. The taste was a flavour combination that works so well together it is perfect. The grape flavour is strong, but not too strong that it overpowers the delicious sour lime sherbet hidden inside. I found this product was almost irresistible and before I knew it, I had devoured the whole Twister Log. 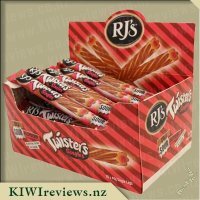 I will be purchasing these again definitely, these are my new favourite RJ&apos;s Twisters to date. RJ&apos;s never fail to impress me and I look forward to more outstanding, yummy treats I can sink my teeth into. I love my lollies, I love sour stuff, I love tangy grape lollies, and I was devastated when Skittles changed the green skittle flavour from Lime to Apple. Add to this, my dislike of traditional black liquorice, and this sour grape and lime twister from RJ&apos;s should be a guaranteed win. First thing I notice after opening the product is that the sour sherbet centre in this product is significantly smaller than that of the cola and raspberry variety. As a result, the non-sour grape gummy is the primary flavour you taste when biting into it. The grape gummy itself is rather subtle in flavour, so the sourness doesn&apos;t really jump out at me. The sherbet centre is such a different composition to the gummy, that if you are careful, you can actually peel away the gummy to separate it from the centre, if you were inclined to try both flavours independently. 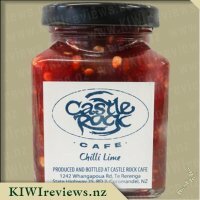 The lime centre has a slight grittiness to it, but it soon melts in the mouth. The lime flavour is enjoyable on it&apos;s own, and is okay when combined with the grape gummy, but the flavour is much less than what I was hoping. As the lime is the only sour component to the twister, and the quantity of the lime is rather minimal (at least combined to the size of the sherbet centre in the cola variety), the product comes across as rather bland. This product doesn&apos;t have that choking factor that other flavours sometimes have; it doesn&apos;t get stuck in my throat, but that doesn&apos;t make up for the lack of flavour. If this was a low-sugar product, I would understand that, but that isn&apos;t the case. It barely has sourness, and hardly has flavour. Give me a batch of the lime sherbet without the bland "grape" casing anyday. RJ&apos;s products are an absolute favourite brand in my household and one which Miss 5 can spot a mile away in any supermarkets confectionery isle, whether it be a old product which she has tried in the past or a new one which she has yet to try (but wants to try). 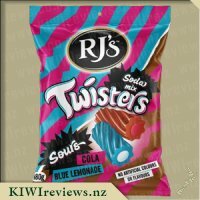 When I saw an opportunity come up to review and try the new RJ&apos;s Grape and Lime Sour Twister Logs I jumped at the chance as I love the fruity twisters which I have tried previously and the addition of a sour sherbet centre sounded like it would be a whole other level of taste and I was right. 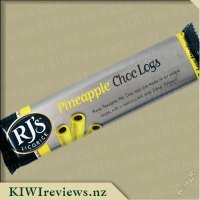 Receiving 3 of these delectable taste tingling logs for review meant that there was enough for each member of my family my partner, Miss 5 and myself. Each of the twisters came individually wrapped in a funky designed plastic/foil like packaging which was super easy to open due to the corrugated edging for ease of tearing. The colours used were bright and colourful a lime green and a bright purple which went perfectly together and resembled the packages contents of the gummy lolly which is also purple in colour with a bright green middle. This packaging would easily be identified on any shelf due to it&apos;s standout colours used. Opening the package for the first time I was delighted by the yummy treat that I had before my eye&apos;s it had a great twist design and texture to it and was such a yummy purple colour which was just perfect for a product of which was flavoured like grape, Miss 5 was equally as excited as purple is her favourite colour. The green sherbet filling also looked great matched with the purple. Taste wise these were amazing a tangy chewy grape outer lolly with a slightly sour lime flavoured filling the flavours were perfect together and made for one of my most enjoyable RJ&apos;s combinations yet, RJ&apos;s just seems to keep producing more and more amazing products! These were an absolute hit with my family so much so that when we were out the other day we had to purchase another one each to take out on our bush walk with us, a great treat to enjoy after a huge walk. At $1.29 each this is a pretty fair price and one which i&apos;m happy to pay. I can&apos;t to see what RJ&apos;s has up their sleeves next, i&apos;m sure it will be well worth the wait.